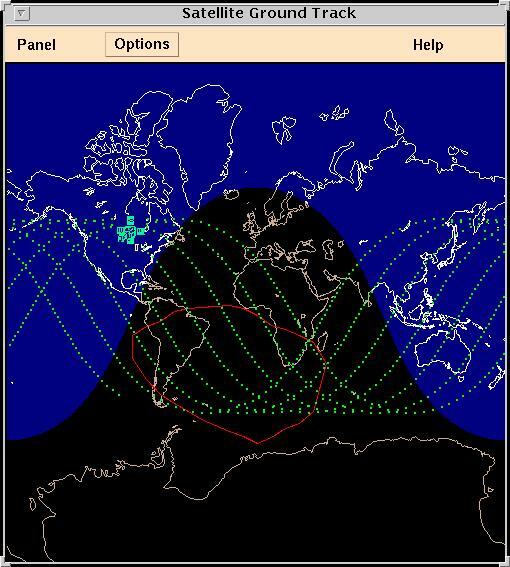 During the daylight portion of each orbit, the pointing platform pointed the instrument toward the Sun’s center, at which time SOLSTICE performed full-wavelength scans. During the night portion of most orbits, it was reconfigured to use the stellar entrance and exit slits, and the platform was pointed to one of the selected calibration bright blue stars. At this point, the instrument was in a fixed-wavelength mode and accumulated stellar data for approximately 15 minutes. Ingesting is the extraction of selected data from the information files (planning aids) to be inserted into our database. 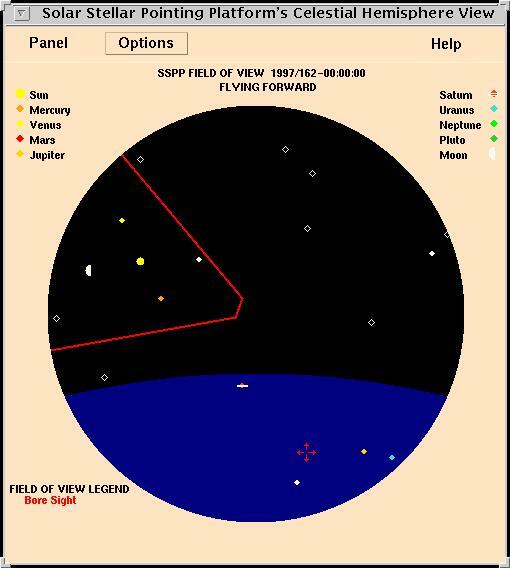 These planning aids were received from Goddard Space Flight Center (GSFC) and contained information about the relative motion and position of SOLSTICE and the corresponding stars available for viewing. Planning used the ingested data from GSFC in conjunction with our own planning procedures and scheduling software to create an observation plan for the week. Our automatic scheduler, OASIS_PS (Operations and Science Instrument Support_Planning and Scheduling), decided what to plan and when, but it is the responsibility of the planner to determine the quality and accuracy of the plans, as well as to make “special science” additions. Creating the data products involved converting the plans into two required formats-text format for the scientists and binary code for the UARS microprocessor. At the end of the day, the data products were electronically sent to GSFC. The Operations and Science Instrument Support – Planning and Scheduling (OASIS-PS) is a software tool designed for resource-oriented planning and scheduling applications. The OASIS-PS system was written in Ada and has four major software subsystem components. An update to the OASIS Ada database written at LASP. CLIPS/Ada (NASA’s C Language Integration Production Shell written in Ada) expert system tool. PASS (Planning and Scheduling System) manager. The OASIS-PS software was designed to support a wide range of planning and scheduling applications and can easily be tailored via database modifications, DECwindows updates, and new rule base creation. OASIS-PS allows for the manipulation of intervals by the user via the user interface and by the expert system via the scheduling knowledge base. These intervals contain application-specific information held in the application-specific database portion of OASIS-PS. This information is transformed by the PASS manager to specific communication message formats which convey schedule information to external elements. Application-specific information may be entered into the database by decommutation software written in the PASS manager. This information may be displayed to the user in a variety of application-specific ways in order to allow the user access to planning data with the context desired for the particular task. In this way both the planning and scheduling information may be presented to the user at a common interface. The user may define application-specific rules to manipulate the intervals. Manipulation of intervals may be done in a variety of ways, with respect to other intervals, with respect to timed events, or with respect to external information. The rules may also be used to constraint-check proposed schedules against existing scheduled activities. Application-specific displays may be added to the user interface in order to allow complex representation or simulation of planning and/or scheduling information. This may require code generation by users for their application, but these displays allow the user greater flexibility and understanding of very complex planning and scheduling information. To support scientists and commercial users involved in a wide range of scheduling applications. To enable scheduling and re-scheduling of activities and resources by the user or automatically by an expert system scheduler. To make efficient use of resources and promote optimal scheduling of these resources. To allow for the proper representation of user planning and scheduling data within the users’ context of operations. Aside from giving scientists valuable information on the present interaction of the Sun’s radiation with the Earth’s atmosphere, future experimentation will also reveal changes and trends such as the degrading “radiation-filtering” ability of the atmosphere due to ozone depletion. SOLSTICE was designed to be a highly variable experiment. The types of experiments performed on the Sun and stars have to be modified due to the changing needs of the scientists and the imperfect science of orbital mechanics. This requires a planning team to coordinate the plans of project managers and scientists within the boundaries of solar and stellar availabilities. Since OASIS-PS is database driven, experimenters may enter application specific data into generic database tables at any time during the mission. This flexibility allows for new and/or modified experiments to be planned by the automatic planning software (OASIS-PS) by simple updates to the appropriate database tables.